Sump pumps are extremely effective at controlling water, then redirecting it out of your basement. A sump pump is a highly effective way of redirecting water away from the foundation and footings of your home, ensuring your basement stays dry while others are getting flooded. A sump pump is usually installed so that the weeping tile system that surrounds the perimeter of the house has a place to drain. This is very important since the old method of draining a weeping tile was to connect it to your drainage system – which is deteriorating and cannot keep up with the huge rainfalls that we are now seeing. This will almost guarantee that your house would eventually get flooded if not addressed properly. WHY SHOULD YOU INSTALL A SUMP PUMP AND BACKWATER VALVE? The global climate is ever changing. Heavy rains and snowfalls are overwhelming the aging sewer infrastructure, and the result has been major flooding in area homes. Residential basements have been particularly impacted. There has been little the homeowner can do to protect their homes against such extreme weather-related flooding. In 2013 the insurance industry spent almost $1 billion repairing clients’ basements and replacing possessions. The good news – there is a solution to keep basements dry and avoid any property damage or loss.  Canada Waterproofers Mississauga will give you a free assessment of the work needed for your home. We’ll show you how to protect your property from any future flooding with the latest in flood protection technology. When a sump pump is installed the old weeping tile connection to the city sewer is severed. That will help avoid flooding. We also highly recommend installing a sewer back-up valve (backwater valve) to protect you from sewage coming back from the city. The pump is installed inside the basement, along the wall – as long as there is a place to discharge the water (so the water doesn’t flow back into the house). Our crews will excavate, remove and dispose of the soil, and install a water tank (also called a sump liner). We’ll then set up a connection from the existing weeping tile (or the new weeping tile, if installed) to the side of the tank. We’ll encase the tank with gravel (3/4″ clear), re-cement around the tank, install a submersible pump, then test the system (discharge water to the exterior). If all checks out and meets our standards, a lid is then put on the tank, bolted down, and you are good to go. This system consists of a separate pump that runs off a marine battery, so in the case of a power failure or a primary pump failure, the back-up pump will automatically switch on. The back-up device can continue to pump water out of your basement without the aid of the main power for up to 24 hours. The battery system also includes an alarm that automatically switches on every time the battery pump kicks in, so you’ll be aware when the main pump is not functioning. The battery back-up pump is very effective. We highly recommend that you install one if you are planning to have a sump pump installed. There is also another back-up pump that can be installed, powered by your water supply. Like fighting fire with fire, water turns the pump turbine which then pumps water out of your basement. The really good thing about this pump is that there is not a time limit as to how long it will run. As long as your water supply is on then the pump will keep on pumping. But like everything there is one catch to this pump. You need a minimum 3/4″ water supply line from the city that comes into your house in order for the pump to work correctly. If you have the supply line, and it’s close to your sump pump, then this is the ideal way to go, as it’s one of the most reliable pumps on the market and doesn’t require any power. A backwater valve is device that prevents outbound water from the home to re-enter through the home’s drain pipes. The valve prevents raw sewage from backing up into the home through toilets, sinks, showers. Municipalities and insurance companies are now encouraging homeowners to install mainline backwater valves. The professionals at Canada Waterproofers Mississauga are experts in installing backwater valves, and would be happy to provide an on-site assessment and a free quote. A crew from Canada Waterproofers Mississauga will excavate where the sewage connection leaves the house (normally in the front of the house), inside or outside the foundation wall. The building code stipulates that the valve has to be within a maximum of three feet from the front wall and you cannot have a Y Pipe connected within three feet behind the valve, or you risk having the sewage back up into the house. Install the city-approved BWV with down-stream, clean-out access in the front of the valve. Have the valve inspected by the city. The Canada Waterproofers Mississauga crew will support the pipework with gravel and then back-fill and compact the ground, followed by inside concrete finish and outside gravel finish. Clean-up is the last step. At Canada Waterproofers Mississauga, we understand that a flooded basement can be very stressful and can cause a huge upheaval in one’s life. We also know that if you take the correct precautions, and have your basement waterproofed and protected with sump pumps and backwater valves, then you will never have to experience that stress or upheaval. If you’ve experienced a flooded basement and you never want it to happen again, or you haven’t ever experienced any flooding, but just want to be sure that it never happens to you, then give Canada Waterproofers Mississauga a call and receive a free assessment of your home. Learn how you can protect yourself and your investment from any future flooding.